An Post, the Irish postal service, has issued a €1 stamp featuring the face of Che Guevara, a leading figure in the Cuban Revolution of the 1950s and 1960s who was murdered 50 years ago on 9 October 1967. The stamp’s design is based on the famous image of Che Guevara by the Dublin artist Jim Fitzpatrick – a poster that decorated the many bedsits and flats that hosted late-night and weekend parties I attended in the 1970s. 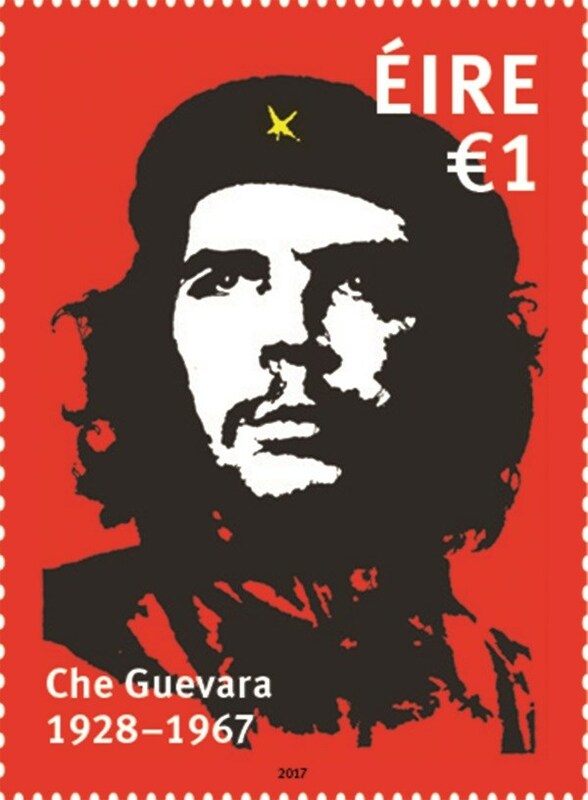 Despite protests in the US, the stamp is appropriate for An Post – not only because Jim Fitzpatrick’s image is now rated among the world's top 10 most iconic images, but because Che Guevara came from an immediate Irish background. Che Guevera was murdered 50 years ago this month in an ambush in Bolivia. Jim Fitzpatrick later produced his iconic image that became one of the most famous images of the 1960s. Jim Fitzpatrick is best known for his elaborately detailed work inspired by the Celtic tradition. But his most famous single work is his iconic two-tone portrait of Che Guevara created in 1968 and based on a photograph by Alberto Korda. Jim and I went to the same school, Franciscan College Gormanston, Co Meath, between Drogheda and Balbriggan – although he was many years ahead of me (he is now 73), and our time there did not overlap. His motivations for producing his poster of Che Guevara were personal and political – he was 16 when he met the revolutionary leader, and he was a left-wing activist by the time he produced his first Che image five years later. Che Guevara visited Ireland on many occasions, and Jim Fitzpatrick met him on one of those visits to Kilkee, Co Clare, in 1963. Jim was then a teenager in school at Gormanston and was working on a summer job at the Marine Hotel pub in Kilkee, the town where his mother was born. One morning, Che Guevara walked into the bar with two Cubans and ordered an Irish whiskey. Fitzpatrick immediately recognised him because of his interest in the Cuban revolution. Knowing about the story of Irish people in Argentina, Jim asked Che about his roots. Che told him that his grandmother was Irish – his great-grandmother Isabel was from Galway and there were other family members from Cork. Later, Jim was in Germany in 1967 when he first saw the famed photograph of Che Guevarra by Alberto Diaz Gutierrez (known as Alberto Korda) in Stern – it was also published that summer in Paris Match. Korda had taken the photograph, ‘Guerrillero Heroico,’ at a rally in Havana in 1960. Che Guevara was captured soon after and was murdered in October 1967. Jim Fitzpatrick’s black and red screen-printed poster version was produced soon after and was based on a high-quality photo of Korda’s original photograph. The poster was a two-colour screen print, with the yellow star on the beret coloured in by hand with a magic marker. The eyes were given a slightly more upward gaze, creating a saintly appearance, and he gave his subject more hair because long hair was then a symbol of rebellion. I recent days, I have also been listening again to Maria Farantouri’s version of Hasta Siempre, Comandante, or simply Hasta Siempre, a 1965 song by the Cuban composer Carlos Puebla. In the 1960s and the 1970s, this song became one of the many anthems in the resistance to the colonels’ regime in Greece. The lyrics are a reply to Che Guevara’s farewell letter when he left Cuba to promote revolution in Congo and Bolivia. The lyrics recount key moments in the Cuban Revolution, and the song, which gained in popularity after Che Guevara’s murder, has been covered by many artists. There are more than 200 versions of this song, which has been covered by many singers. Although Victor Jara never sang this song, many attribute the Carlos Puebla version to him by mistake. The title is a part of Che Guevara’s well known saying ¡Hasta la victoria siempre! (‘Until victory, always!’). Maria Farantouri is one of the finest Greek singers of the 20th century, and she celebrates her 70th birthday next month on 28 November. During the colonels’ regime in 1967-1974, Maria Farantouri recorded protest songs in Europe with Mikis Theodorakis. In 1971, she recorded Songs and Guitar Pieces by Theodorakis with the Australian guitarist John Williams, which included seven poems by Federico García Lorca. She has recorded songs in Spanish, including ‘Hasta Siempre Comandante Che Guevara,’ Italian, and English (‘Joe Hill’), as well as works by Greek composers.